Following consultation and imaging, the procedural phase puts the proposed treatments into action. Here, active treatments and active medical interventions are carried out according to the consultant’s careful diagnoses. In the medical community, surgeons, collectively, and interventionalists are known as proceduralists. Click here to meet our team of proceduralists. What is ambulatory phlebectomy & ligation? What are the risks and complications of sclerotherapy? What are the risks associated with vein disorder treatment? What do I need after treatment? Copyright 2018 North Shore Medical Group. All Right Reserved. You just clicked outside of the frames! Remember my option. Do not show me this dialog again. Parking Guide: Onsite parking access from Greenwich Road. Use underground parking ramp and contact suite 303 for access. Success in treatment of surface veins is measured in terms of cosmetic appereance . After one treatment session of microslerotherapy to one leg, most patients can expect a 50% improvement in the appereance of unsightly veins. it is important to understand that perfection is seldom achieved. How Successful is Ultrasound Guided Sclerotherapy? Success in treatment of truncal veins is measured in terms of closure of diseased veins and reduction of symptoms such as leg pain, heaviness and aches etc. Frequently patients report a 10 to 20% improvement in the cosmetic appereance also. Approximately 75% of patients can expect to have their truncal venous disease treatment complete after a single Ultrasound Guided Sclerotherapy Session to the affected leg. How much can cost my treatment? The cost of treatment is dependent on the severity of the venous disease. The practices uses the standard Australian Medical Association (AMA) rates or less. Medicare provides a rebate for injection of symptomatic varicose veins larger than 2.5mm in diameter. You may be entitled to a higher rebate if you are registered with Medicare for the "Safety-net". How my treatment plan works? A thorough understanding of the treatment plan including expected fees is absolutely necessary. Your treatment plan must be tailored to your specific requirements and should be done by an experienced medical practitioner. As a general rule, all treatments visits must be followed with compression stockings and a daily walking routine. 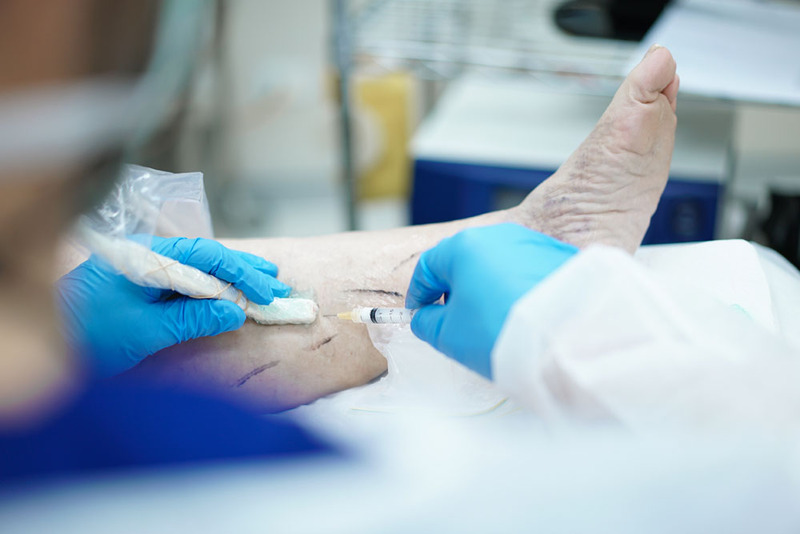 To comply with safe drug level limits and to help reduce the risk of complications such as deep venous thrombosis, treatments are usually restricted to one leg per treatment session. For these reasons, treatments are usually alternated from side to side on a weekly basis. What is Venous Disease and what causes it? Venous disease describes the abnormality found in the venous system, which usually results in enlarged veins that serve no useful function. The cause of the enlargement and malfunction of the veins is excessive pressure exerted by the blood on the thin walls of veins. The excessive pressure is the result of abnormal valves and gravity. The valve malfunction is most often caused by the stretch and sag of the valve ring wall. The diagram below demonstrates the difference between a normal and abnormal valve. Factors that are known to contribute the sagging of valvular rings and thus valve malfunction include: Increasing age Varicose Veins (this is the most important treatable cause for abnormal veins) Hormones – especially Oestrogen (female hormone) Occupations which involve prolonged standing or sitting Strong family history Pregnancy Other factors It is for these reasons that prevention should be targeted at addressing the above factors that can be reversed. What types of venous disease are there? Can Varicose Veins be prevented? There is no known method of prevention. Wearing specialised venous support stockings may prevent some dilated blood vessels from developing in some people. Maintaining a normal weight and regular exercise, especially walking, may also be helpful. Certain footwear may restrict normal ankle movement and these include high heeled shoes. So people who are susceptible to venous disease should avoid wearing this type of footwear. Sclerotherapy involves the injection of a sclerosant into the diseased veins. The sclerosants most commonly used are Sodium Tetradecyl Sulphate and Aethoxyscerol. When sclerosant is injected into the diseased vessel, it causes the wall to become so damaged that it initially shrinks, becomes inflamed and later ‘glued’ to itself. The complete process usually takes approximately 2-3 months. Sclerotherapy has been used for spider veins since the 1930s and long before that for larger veins. Over the past 5-10 years the sclerotherapy technique has been vastly improved through the use of ultrasound technology and sclerosant foam. Foam is formed by mixing 1/10 to 1/20 of the usual volume of sclerosant solution with air. With a fraction of the sclerosant solution that was formerly required, the same outcome may be achieved with foam. The European Consensus Meeting on Foam Sclerotherapy (Germany - 4th-6th April, 2003) and the Australasian Consensus 2004 has fully endorsed the use of foam. What types of Sclerotherapy are there? Depending on the size and location of the diseased vein, a selected concentration and volume of sclerosant is required. For this reason visible veins are treated using Micro-sclerotherapy because the diseased vessels can be directly visualised. Diseased truncal vessels, which are not readily visible require the use of ultrasound. Ultrasound is used to identify the diseased vessel and guide the needle into the vessel for the purpose of injecting sclerosant. This procedure is known as Ultrasound Guided Sclerotherapy. Is Sclerotherapy a painful procedure? No. Sclerotherapy is generally very well tolerated. Patients with a fear or phobia to needles have been treated with minimal fuss. Ultrasound guided sclerotherapy involves up to 5-10 injections. The needle used is finer than that used to take a routine blood test. Often there is no further sensation after the injection. Micro-sclerotherapy may involve up to 20 to 30 injections in a single treatment session. The type of needle used for this technique is the similar in size to that used for acupuncture. What is trapped blood and how does it occur? Trapped blood occurs in approximately 1 in 3 patients who receive any form of sclerotherapy. It has been mentioned earlier that sclerotherapy causes shrinkage and closure of diseased veins. Often there are sections of incompletely treated veins between segments of completely treated veins. This trapped blood causes noticeable bruising and small segments of lumpy, tender veins but does not usually occur until 2 to 4weeks after the treatment session. To prevent pigmentation, it is important to release all occurrences of trapped blood. This is done with a needle prick and requires no other special care or attention. Patients who are either immobile or unable to wear grade 2 compressive stockings are not suitable for sclerotherapy. Also patients with a strong history of deep venous thrombosis (DVT) or blood clotting disorder must be treated with extreme caution. DVT risk factors can be readily identified with the Personal Profile©. The risk of DVT per sclerotherapy treatment has been reported in the scientific literature as ranging from 1 in 500 to 1 in 1000. In simple terms, the risk of DVT with sclerotherapy treatment is approximately equivalent to the DVT risk associated with flying long distances, taking hormone tablets or smoking heavily. Remember also that untreated varicose veins are a risk on their own. Early detection and prompt treatment remain the best option for managing this complication. In patients with no additional risk factor, Sclerotherapy is a very safe treatment option. Will the abnormal veins keep coming back? Sclerotherapy should not be performed on patients who are pregnant or intending to become pregnant. The same rule applies to mothers who are breast feeding. There is no current data available on the effect of using sclerosants during pregnancy or breast feeding. Sclerotherapy treatment well in advance of becoming pregnant is advisable as it may assist in reducing the overall disease progression during pregnancy. Unlike surgical stripping, new varicose veins that may appear following pregnancy can be quite easily managed with sclerotherapy. The Micro-sclerotherapy procedure is performed in the treatment room and takes approximately 1 hour for the entire process. This includes set-up, pack-up, application of stockings etc. The Ultrasound Guided Sclerotherapy procedure takes approximately the same amount of time but is performed in the vascular laboratory at the same premises. Exercise and Activity CONTINUE with your normal work, and or normal exercise routine. WALK for a minimum of 20 minutes immediately after each treatment. WALK for at least 45 minutes per day. This is required for a minimum of 2 weeks after each treatment session. Note: Walking is also essential to prevent thrombophlebitis (excessive inflammation in the treated vein) and deep venous thrombosis (clots). Research has demonstrated that exercise combined with compressive stocking reduces the risk of post treatment skin pigmentation. DO NOT confine yourself to bed and walk as much as possible, AVOID standing still for prolonged periods AVOID activities that cause you to exert your self excessively especially jogging, squats and constipation. Pain & Discomfort You should NOT experience any pain after the treatment. If you notice any severe or continuous pain, or any swelling of the legs please contact the clinic on (02) 9439 2899 or Dr Gracé on mobile 0403 711 355. You may require Aspirin or other suitable anti-inflammatory medication such as Nurofen®, Naprogesic®, Naprosyn®, Voltaren®, Indocid®, Celebrex®, and Feldene® etc. Compression Leave your compression stocking on continuously for 24 hours. During this time you will be able to bath by rolling the stocking down to the mid thigh or covering the stocking with a plastic bag or waterproof overstocking and sealing with tape at the top. For the next 3 days after the period of continuous compression you may remove the stocking for brief showers or baths (5 minutes). The compression stocking must be replaced immediately afterwards. From the 4th day you may remove the stocking just before going to bed but you must put the stocking on again first thing in the morning. Continue to wear the stocking during the day only for the next 10 days, totalling 2 weeks. Keep the time you spend standing without the compression stocking to an absolute minimum. If you have any foot pain or discomfort at night that disturbs your sleep, remove the stocking IMMEDIATELY. Please make sure you put the stocking on before getting out of bed the next morning. Note: Watch for creases in the stocking. It may creep down and gather at the knee. In this case, stocking glue may be required to hold the stocking in place. Note: Compression minimises formation of blood trapping and pigmentation, reduces the number of treatments necessary and reduces the risk of deep venous thrombosis. The stockings are known as Grade 2 Compression Stockings must be thigh-high and at least Grade 2 (30-40mmHg) and may be purchased from leading pharmacies. Any surgical or invasive procedure carries risks. For this reason, if you have any doubts after all your questions have been answered, you should seek a second opinion from an appropriately qualified health practitioner. Bring your Vein Treatment Patient Information Booklet © 2015 to EVERY clinic visit. Ensure you have received and understood the results of; Ultrasound Scan Blood Tests Factor V Leiden Prothrombin Gene Mutation Factor VIII Homocysteine Lupus Anticoagulant PC PS APC MTHFR For at least 4 weeks prior to, during and 4 weeks after each treatment, be sure to STOP all medication containing; Iron Steroids or hormone replacement therapy (HRT) Oral Contraceptives Vitamin K Tetracycline Ensure you have NOT booked any long-distance travel (> 4hours) for at least 4 weeks prior to, during and 4 after vein treatment. Let us know if you have had a VENOCUFF® operation in the past. Wear slacks or loosely fitted clothing to your appointment, as they will conceal the compression stocking. You will be expected to commence your daily walk immediately after the procedure. Bring your compression stocking (GRADE 2 THIGH-HIGH) to each appointment. Stockings may be purchased at the clinic or your nearest chemist. DO NOT smoke cigarettes for 2 weeks prior to, during and after vein treatment. Purchase necessary medication prior to procedure (eg. Clexane™). How is the Endovenous Ablation (EVA) treatment? Procedure Description: The EVA procedure is a relatively new method of treating varicose veins without the need for surgery. High intensity light energy or radiofrequency is used to destroy the abnormal veins. Procedure Time: Approximately 60 minutes. Anaesthesia: Local anaesthetic (lignocaine) is used only and sedation is not required. Recovery: In almost all cases the EVA procedure causes minimal after-procedure pain, a quick recovery period and almost immediate relief of symptoms. Walking immediately after the procedure is an absolute requirement and must be continued for at least 14 days after. Pain and excessive bruising can be minimised through the use of extra compression (GRADE 3). Duration of Results: Published clinical and scientific studies show that (EVA) has approximately an 85-90% continued success rate 10 years after treatment. Risks & Complications: There are no known long term risks associated with the use of lasers in medical treatments. As with any therapeutic technique, sclerotherapy and endovenous laser may cause complications. The over-all risk with these procedures compare quite favourably with surgery. No anaesthetic is required, no hospitalisation, no sedation and no time off work or physical activities. Painful Leg (Superficial Phlebitis) Risk: Approximately 1 in 70 treatments. Presentation: Pinkish tender region that follows the course of the treated vein. Onset is usually 1-3 weeks after the treatment and lasts 1-3 weeks. Cause: Excessive inflammation in the treated vein in susceptible individuals. Predictable: No. Likelihood: More likely if compression is inadequate, stockings are not worn; or if stockings are not fitted correctly. Prevention: None Management: Responds quickly to; ice, Aspirin/Nurofen®, stockings and continuation of the daily walking schedule. An ultrasound needs to be performed to exclude deep vein thrombosis, because up to 1 in 10 of these cases of thrombophlebitis can progress to deep venous thrombosis. Resolution: Complete and spontaneous over 1-3 weeks. Small Painful Wound (Dermal Necrosis) Risk: Approximately 1 in 400 treatments. Presents as: A small painful ulcer at or near one of the injection sites. Approximately 5 to 10mm in size and initially quite painful. Caused by: Sclerosant reaching the arterial vessel usually through abnormal connections within the vascular system. Predictability: No More likely if: There is an underlying or hereditary tendency to have arterio-venous or vascular malformations. Avoidable: Yes, but only if the existence of arterio-venous malformations is known prior to treatment. Managed by: Application of dressings to cover the wounds for 4 to 8 weeks. Resolution: Complete and spontaneous, although the scar is permanent. Deep Venous Thrombosis (DVT) Risk: Approximately 1 in 500-1000 treatments. Presentation: Painful or swollen leg or calf. Often identified during the routine ultrasound examination at the 1 to 2 weeks after treatment. Cause: Blood clot in the deep venous system. A greater than normal hereditary risk of thrombosis otherwise known as thrombophilia. Predictable: Yes, a thrombophilia screen may be performed prior to treatment to identify patients at risk. More likely if: Patient has a history of being a smoker. Patient has a personal or family history of DVT in the past. Recent long distance travel, greater than 4 to 8 hours of immobilisation in tight cramped seating. Severe dehydration or excessive consumption of alcohol, at or around the time of treatment. Recent surgery or hospitalisation. Failure to adhere to compression of the lower limbs after treatment. Prevention: Yes, by addressing the measures identified above. Management: Thorough investigation with the aim of identifying the cause of the deep venous thrombosis. Anticoagulants should be considered and commenced immediately to treat the blood clot and to help prevent progression. Untreated or severe DVT may progress and cause pulmonary embolism or death. Resolution: Over 90% of patients recover completely within 3 to 6 weeks. In addition, the DVT risk associated with treatment returns to normal after 3 to 4 weeks. Migraine Headache / Visual Effects Risk: Approximately 1 in 800 treatments. Presents as: Symptoms usually occur, 10 to 20 minutes after the treatment has been completed. Symptoms may include; dizziness, light headedness; visual defects including transient blindness and last for approximately 15 to 30 minutes. Caused by: Sclerosant solution reaching the cranial circulation. Predictability: Yes. More likely if: Patient has a history of migraine headache Patient has a history of a ‘hole in the heart’ or patent foramen ovale High volume of sclerosant is injected. Prevention: Yes; elevation of limbs during the injection procedure, the use of small injection volumes; the use of carbon dioxide gas (CO2) and longer recovery period in the lying position after injection. Managed by: Observation and vital signs examination for the duration of the episode; Thorough investigation to identify the cause including ultrasound echo-cardiogram Resolution: Complete and spontaneous within half to 1 hour. [PICTURE/DIAGRAM OF MIGRAINE] Systemic Allergic Reactions Risk: Approximately 1 in 1500 treatments. Presents as: Rash, pallor; light headedness, loss of consciousness. Caused by: Allergic reaction to the sclerosant. Predictability: No. More likely if: Patient has a known allergy to the drug in the past. Avoidable: No. Managed by: Antihistamine, oxygen; adrenaline and acute resuscitative measures. Resolution: Complete within minutes. [PICTURE/DIAGRAM OF ALLERGIC REACTION] Adjacent Nerve Damage Risk: Approximately 1 in 2500 treatments. Presentation: Loss of sensation or function corresponding with the nerve that has been affected. Cause: Sclerosant inadvertently damaging the micro-blood supply to the affected nerve. Predictable: No Prevention: None Management: None Resolution: Slow and gradual recovery though recovery may be incomplete. Note: it is required to complete a booking before starting your telehealth consultation. By confirming, you acknowledge that you have read and agree to the Terms and Conditions. I acknowledge that I have read and agreed the above Terms and Conditions. Thank you for choosing North Shore Vein Clinic. Please note one of our team members will contact you shortly to confirm this booking and give you more information. Thank, we will be in contact with you!